Remarks:Indirubin is a potent and selective CDK inhibitor. Indirubin is the active ingredient of Danggui Longhui Wan, a mixture of plants that is used in traditional Chinese medicine to treat chronic diseases. 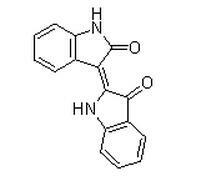 Indirubin has been used to treat the symptoms of leukemia. Further biological explorations revealed the ability of indirubin to bind cyclin-dependent kinases and 6-bromoindirubin, extracted from mollusks, to bind glycogen synthase kinase-3. Studies have shown that Indirubin can help keep cancer cells from reproducing in rats. Indirubin also appears to reduce inflammation by inhibiting part of the immune response.